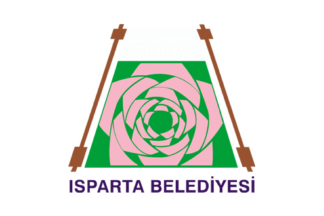 The municipality of Isparta (219,904 inhabitants in 2012, 198,385 in the town proper; 68,241 ha) is located 130 km north of Antalya and 350 km south of Eskişehir. 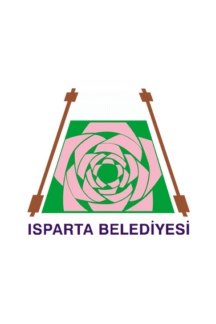 The flag of Isparta, used horizontally (photo) or vertically (photo), is white with the municipality's emblem. "Belediyesi" means "Municipality". The emblem of the municipality features a rose, recalling that the town is nicknamed "City of Roses". Isparta, one of the world's largest producers of rose oil, made its name supplying rosewater to the Grand Mosque in Mecca. The rose harvest only runs for around six weeks, typically between late May and early June, but with some 35 processing factories and plantations spanning a 20-kilometer radius around the city, it is a vital source of revenue for the region. Since Müftüzade İsmail Efendi drained the very first droplet of rose oil back in 1892, the market for the prized oil has steadily increased, and Sebat is a factory at the forefront of the modern industry, producing 250 kilograms of rose oil a year and more than two tons of rose concrete (solid oil). With a kilogram of rose oil retailing for around 8,000 euros, you can start to understand the acclaim of the simple flower. Sebat is also the first to venture into organic production, with buyers including popular eco-friendly brands Weleda and Lush cosmetics, and has even started construction on a luxury wellness center set amid the factory's 300-400 hectares of organic rose and lavender plantations. Out of around 500 varieties of rose, the Damascena or Damask rose is one of only four or five from which it is possible to extract rose oil, and with 4,000 kilograms of roses (an entire truck load) needed to produce a mere kilogram of rose oil, the growers and harvest workers play a crucial role in production. The roots of the hybrid flower are steeped in Middle Eastern legend, although most Turkish growers credit Bulgaria with bringing the variety to Turkey. Isparta's rose production dates back some 200 years, traditionally grown, harvested and distilled by local villagers. While modern technology and a quality control regime are now employed to satisfy the international market -- between 95 and 99 percent of the rose oil is exported -- Sebat is keen to help preserve these small family businesses, sourcing their roses from 34 different villages over the Isparta region and often supplying farmers with payment advances to help supplement production. In a further ode to tradition, one of the most fascinating elements of the factory tour showcases a fully working traditional distillation unit -- a surprisingly sophisticated design featuring a huge copper kettle that holds around 15 kilograms of roses. Legend has it that to keep the workers awake during the distillation process -- the scent of rose oil is said to make you sleepy -- the villagers would pound a rhythm on the sides of the kettles, perhaps the humble beginnings of today's Rose Festival, which brings traditional music and entertainment to the city to coincide with the harvest season. 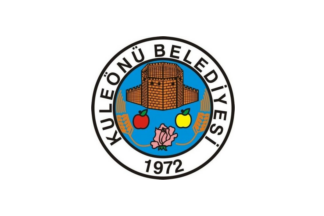 The flag of Kuleönü is white with the municipality's emblem. 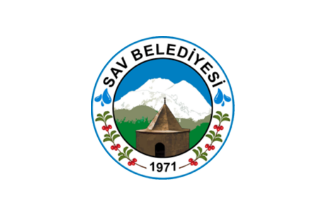 "Belediyesi" means "Municipality". The municipality of Sav (aka Savköy; 3,560 inhabitants in 2014) is located 10 km of Isparta. The flag of Sav is white with the municipality's emblem. 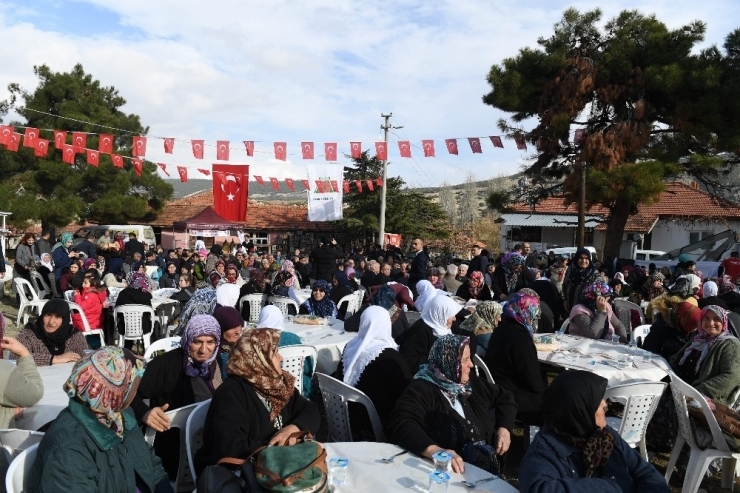 "Belediyesi" means "Municipality". The emblem of the municipality features İncili Çavuş' mausoleum. İncili Çavuş is a semi-legendary figure of Ottoman comic wisdom. The figure might have been based on a real person who lived in the 16th-17th centuries. Other alleged İncili Çavuş' mausoleums are found in Aksaray and İstanbul. SDÜ, established on 11 July 1992 in Isparta, is named for Süleyman Demirel (1924-2015), Prime Minister (1965-1971, 1975-1977, 1977-1978, 1979-1980, 1991-1993) and President of the Republic (1993-2000). Demirel was born in Atabey (Isparta Province). SDÜ is composed of 16 Faculties, 2 Schools, 12 Vocational Schools and 4 Graduate School. The flag of SDÜ (photo, photo, photo, photo, photo, photo, photo, photo) is white with the university's emblem.